Peregrine falcons have been nesting on the Union County Courthouse tower in Elizabeth for at least seven years. While they originally attempted to build nests around the tower, those nests repeatedly failed, so with the assistance of New Jersey Department of Environmental Protection, the County erected a nest box in 2006 and every year since, a pair of falcons has produced new offspring. 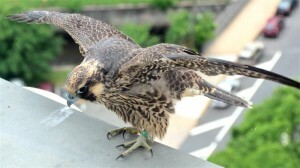 Every year, state wildlife biologists climb the top of the courthouse to band the new chicks, Peregrine falcons are crow-sized predatory birds and are an endangered species, according to state wildlife officials. Falcons traditionally have nested on cliff faces and rocky outcrops, but as these habitats vanished, the birds turned to high buildings and bridges to build their homes. In the 1960s and 70s there was a steep decline in numbers, often attributed to the widespread use of DDT. Since the pesticide was banned, their numbers have increased, although they are still considered an endangered species. State officials estimate that there are only 25 known pairs in New Jersey. Falcons are raptors, “birds of prey,” a group of birds that includes hawks, owls, eagles and vultures. They are considered to be the fastest animal on the planet in its hunting dive, the stoop, which involves soaring to a great height and then diving steeply at speeds commonly said to be over 200mph. Raptors have fascinated people for thousands of years. Fortunately, after some disturbing declines in some of the largest species, raptors represent some of New Jersey’s greatest success stories, with the DEP working to restore the population. The bald eagle, osprey and peregrine falcon have made impressive comebacks from the brink of extinction, in large part thanks to the efforts of division biologists. Unfortunately, not all species of raptors are thriving – the American kestrel, for instance, has experienced a sharp decline in recent years, and the work of biologists in the State’s Endangered and Nongame Species Programcontinues. Peregrine falcons, like other birds of prey high on the food chain, were particularly susceptible to DDT which caused their eggs to fail. They became extinct east of the Mississippi by 1964. They were one of the first birds to be the focus of conservation, however, and through an intensive reintroduction program, returned to the skies in New Jersey and other eastern states in the 1980s. The population in New Jersey has been about 20-24 pairs annually since 2000. In 2003 peregrine falcons returned to their historic cliff nesting habitat on the Hudson River Palisades – a huge milestone in the peregrine’s recovery in the state and the region.